Arguably, outsiders' perception of a faith is moulded by its adherents, and it is no different for Islam. The perception of Islam (and of Muslims) has changed during different chapters in history. From being depicted as a merciful force of conquerors, to a technologically-advanced civilisation, to more recent controversial tags, the image of Islam has taken many shapes. Accordingly, some Muslims around the world take in these pe...rceptions to form their identities, while other Muslims reject them and prefer to interpret and project their own Muslim identity. Different cultural and socio-political contexts add more layers of complexity to the notion of Muslim identity. What, then, is really the core of the “Muslim identity”, if there even is one? Who gets to define it? How have Muslims been defining ourselves for the last 1,400 years and why do others see us differently sometimes? 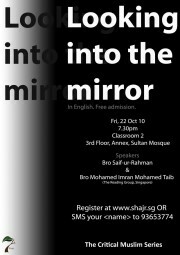 Join us for a thought-provoking evening with Bro Saif-ur-Rahman and Bro Mohamed Imran as we explore these questions. 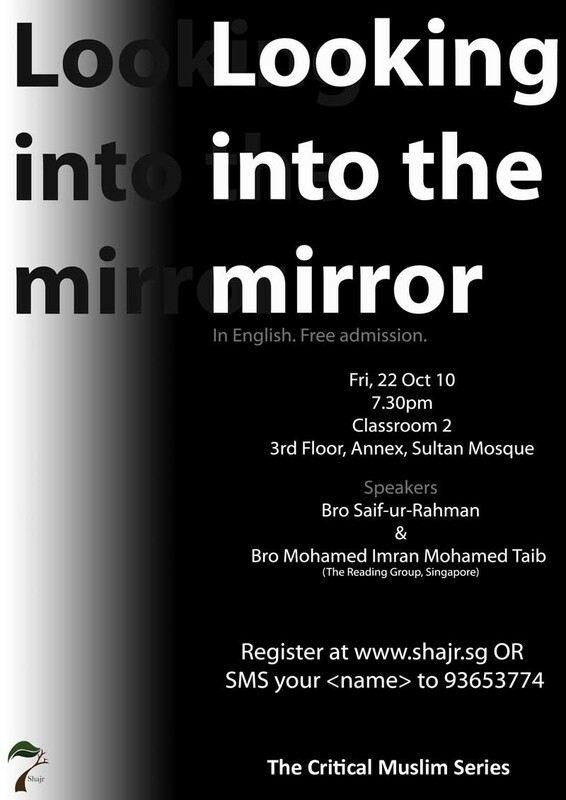 Register today by visiting www.shajr.sg, or e-mail shajrevents@gmail.com or SMS your to 93653774. Be sure to come along and forward this event to all your friends!